How did you start? A friend in high school. What kind of climbing do you prefer? 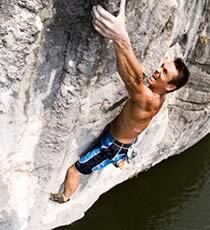 Sport Climbing. Describe the perfect day: A sunny 45 degree day. What have you learned from climbing? To enjoy the beauty that surrounds you. What significance does climbing have in your life? It’s my passion and I’m always wanting to improve. Are you afraid to die? Yes. Whatever happens will happen. What did your mother say when you started climbing? You are a CRAZY boy. What does your mother say about it now that you’re jet-setting, rich and famous? Ha Ha. What’s your favorite food? Indian. What are you driving? Toyota pickup and Suzuki forenza. Do you watch TV? Sometimes. Family Guy is the best!!! Do you climb competitively? At times. Why? I will do some outdoor bouldering comps. What do you like most about comps? Seeing friends I haven’t seen in a while. What do you like least about comps? The pressure to do well. What do you think of the comp scene? If your psyched, do it! How do you train for comps? Boulder a lot. Do you climb indoors a lot? Usually when the weather is bad. Does it make you stronger or weaker? Stronger. What other activities do you participate in? Yoga and weight training. What’s the hardest sport you’ve tried? Motocross. How much do you travel? 2 months out of the year in the summer time. What’s the most over-hyped area? Rifle. What’s the most under-hyped area? My secret crags. Do you train your weaknesses or your strengths? Both. Whatʼs the best thing about being in a photoshoot? Seeing amazing photos afterwards. The worst thing about being in a photoshoot? Posing. What advice would you give to someone that wants to be a professional climber? Climb, climb, climb. What’s your favorite BlueWater product? Lightning Pro. Why? Very light weight and durable.